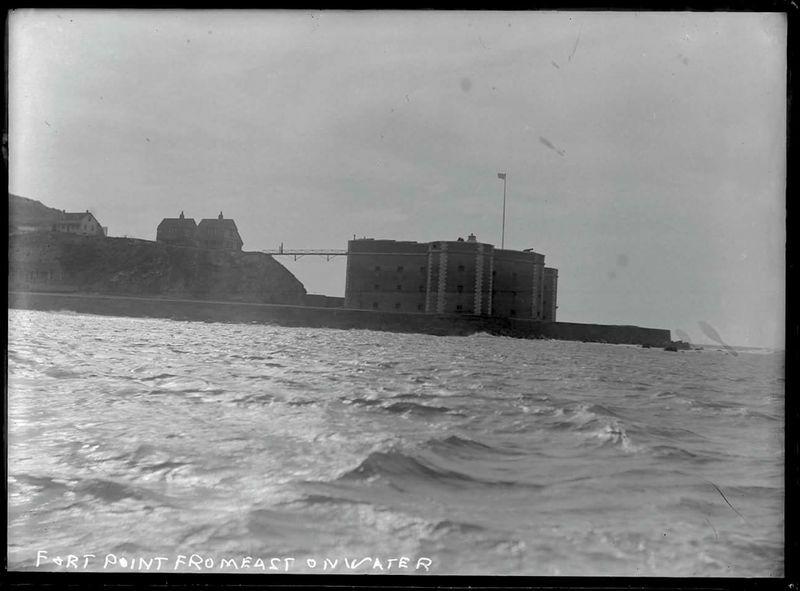 Fort Point from the water, late 19th century. The road to Fort Point offers unparalleled scenic views of San Francisco Bay and the Golden Gate Bridge. The ocean swells attract flotillas of western grebes and chilly surfers. If you can tear yourself away from the view, check out the bluffs above the road. Like the coastal bluffs around the headland towards Baker Beach, these cliffs are tinted with the blues and greens of serpentinite rock. Soils derived from such rocks lack essential nutrients and are spiked with heavy minerals such as lead and nickel. Serpentinite outcrops, often sheared and fractured from their origin near active faults, are more weepy than other rocks. The ground water that seeps through the fractures create wetlands that remain moist even in the middle of summer. Serpentine seeps are scattered along the bluffs on the road to Fort Point, along the southern end of Crissy Field, and north of Baker Beach. In spring and summer these serpentine bluffs and seeps are stippled with delicate-looking wildflowers that are tough enough to withstand the stressful soils and withering salt spray and ocean wind. The rare coast rock cress (Arabis blepharophylla) displays its pink blossoms in early spring. The rare Franciscan thistle (Cirsium andrewsii)--limited to only a few dozen individuals south of the Golden Gate but a little more common in Marin, the only other county where it is found-- occurs in several seeps and blooms later in the summer. In the early 1850s, according to the recollections of H. H. Behr, the bayshore east of Fort Point was fringed with California bay trees (Umbellularia californica). Very few if any bay trees still occur in San Francisco. Without active stewardship by park staff and volunteers, these bluffs would be taken over by pampas grass and ivy. Fort Point. 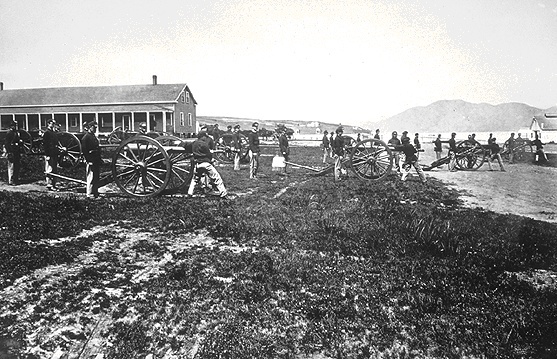 Follow Lincoln Boulevard to Long Avenue; the Fort is under the southern end of the Golden Gate Bridge. The ghosts of a thousand wars that never came still haunt this mysterious site nestled beneath the San Francisco end of the Golden Gate Bridge. 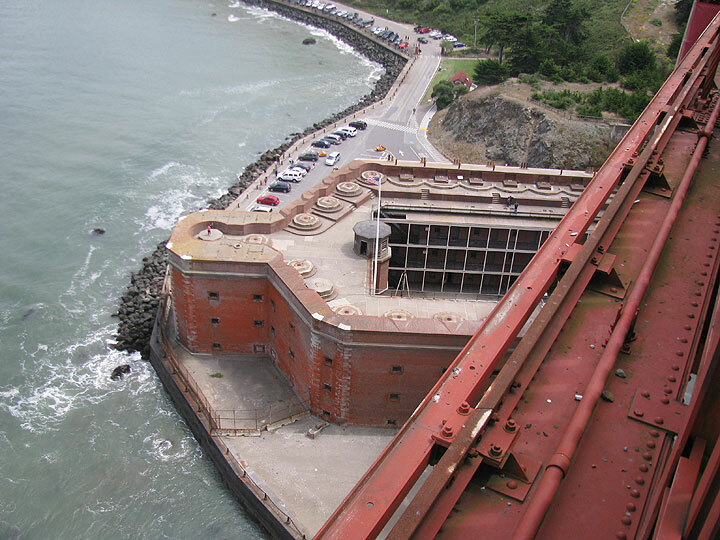 It was built between 1853 and 1861 to defend San Francisco against attack by sea. There were only two problems: There were never any attacks by sea, and, if there had been, the cannons in the fort would have been militarily useless against an invading enemy fleet. 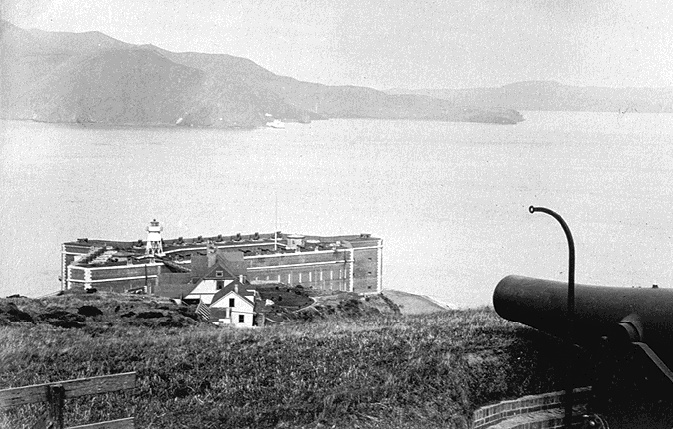 Today, the ritual of make-believe defense against a nonexistent enemy continues, as Civil War cannon loading and firing demonstrations are held at 12:30 and 2:30 p.m.
An 1897 plan to defend the Bay with a network of floating explosive devices detonated by a newfangled invention: electricity. This bizarre plan, designed by none other than Thomas Alva Edison, was never put into effect. A system of submarine nets stretched across the mouth of the bay to snag Japanese subs. Though the nets were actually put into place, they never caught any subs. 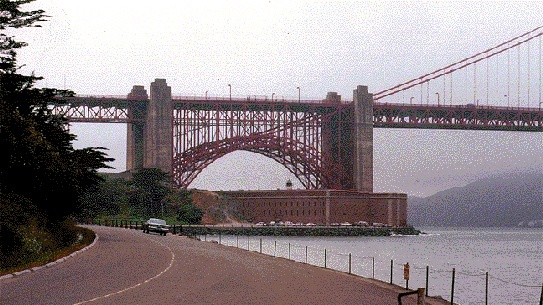 Southern end of the Golden Gate Bridge with Fort Point under it. Mid 1990s. Fort Point from Golden Gate Bridge, 2009.